If you love photography and can go up to any extent to capture the best shot, then you should not miss the following bird photography destinations in Maharashtra. These exotic places are all set to provide you with the best of frames as you can spot here hundreds of rare and endangered species of birds. Even though these bird sanctuaries are mostly visited by locals and wildlife photographers, you can still find here hundreds of tourists pouring in from different states and cities to witness the splendour of exotic beauties thriving in the form of birds. Are you a wildlife photographer? Well, if yes, then you are assuredly bound to explore the beauty of these beautiful bird photography destinations. Wouldn't you love to explore the beauty of colourful birds through the lens of your camera? These places in Maharashtra are also perfect destinations for picnickers and nature lovers. Read on to know more about these beautiful spots. Located in the Aurangabad district at a distance of about 50 km from the city centre, Jayakwadi Bird Sanctuary comprises of small yet beautiful islands in the reservoir of Nath Sagar which is formed by Godavari river. These islands are characterised by beautiful trees and green vegetation, thereby, creating a perfect environment for the settlement of birds. As per records, these picturesque islands in the shallow waters are home to more than 200 species of birds, which include indigenous as well as migratory birds. The major species found here include cranes, shovellers, godwits and brahminy ducks. So, how about getting yourself to this breathtaking place and going on a photography mode? The largest national park in Maharashtra, Tadoba Andhari Tiger Reserve is spread over an area of about 625 sq km and was established in the year 1995. It is located in the Chandrapur district and is known for its tiger population, the major attraction of the national park. However, it is also home to several species of plants, birds and other animals. Therefore, it is equally popular amongst nature lovers and wildlife photographers. If you are looking for a place around Nagpur where you can experiment with your photography skills as you capture the captivating beauty of rare birds, then Tadoba Andhari Tiger Reserve is the place you should consider visiting. The major species of birds found here include Indian pitta, orange-headed thrush and paradise flycatcher. You can also spot several peacocks here. Don't you think it's a wonderful place to explore on the weekends? 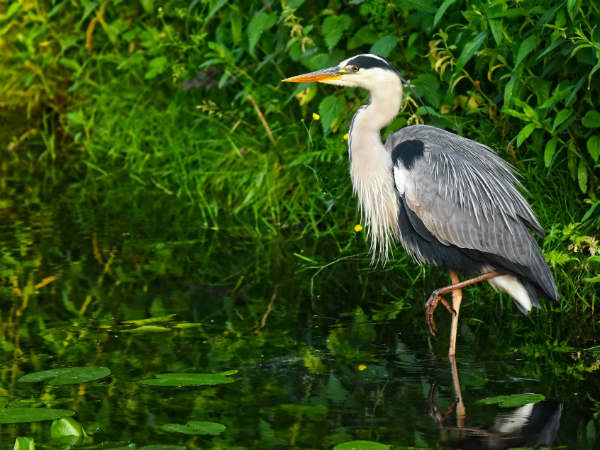 Located in a small hamlet on the borders of Pune and Solapur districts, Bhigwan Bird Sanctuary is a popular destination for wildlife photographers. If you live in Maharashtra and love photographing wildlife beauties, then you should not miss out on exploring this exotic destination where you will be exposed to hundreds of migratory and indigenous birds. Bhigwan Bird Sanctuary is mainly famous for the population of flamingos. Other species here include heron, egret, painted stork and several species of raptors. As of today, it is home to about 250 species of birds and due to its mass population of migratory birds, it is also known as mini Bharatpur. So, how about capturing the beauty of flamingos and other colourful birds here? Another beautiful destination for bird-watchers and photographers, Tansa Wildlife Sanctuary is located in the vicinity of Mumbai at a distance of about 90 km and hence, it is a perfect weekend getaway amidst natural expanse. Adorned by the presence of Tansa Lake, this beautiful sanctuary is home to several beautiful species of birds like hornbill, woodpecker, crested serpent eagle, egret and bulbul. Apart from birds, you can also spot numerous species of animals and butterflies here. Don't you think it's a perfect place for photography around Mumbai? Where else can you find an amazing mix of a lake, a forest, lush vegetation and diverse wildlife? Famous for the population of herons, egrets and flamingos, Nandur Madhmeshwar Bird Sanctuary is one of the least-explored photography destinations in Maharashtra. Hence, you can peacefully frame the beauty of wildlife without any disturbance from the tourist crowds here. It is located in the Nashik district at a distance of about 38 km from the city centre and is one of the richest parts of Maharashtra. Apart from the above-mentioned species of birds, you can also spot species like osprey, ibis, pintail and harrier. So, what do you think about a trip to Nandur Madhmeshwar Bird Sanctuary this weekend?